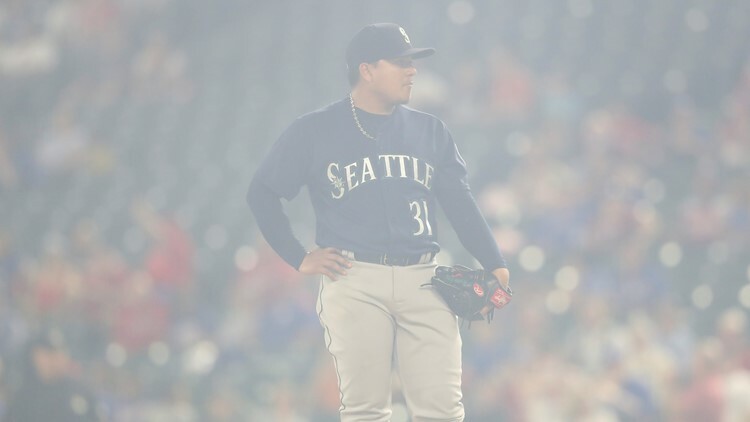 Adrian Beltre hit a three-run homer in the first inning and finished with a season-high five RBIs, and the Texas Rangers beat the Seattle Mariners 8-3 Friday night in a game halted by rain with two outs in the top of the seventh inning. ARLINGTON, Texas (AP) - Adrian Beltre hit a three-run homer in the first inning and finished with a season-high five RBIs, and the Texas Rangers beat the Seattle Mariners 8-3 Friday night in a game halted by rain with two outs in the top of the seventh inning. The Rangers snapped a four-game losing streak and won their first game under interim manager Don Wakamatsu. Texas fired Jeff Banister on Friday morning. The Rangers are 65-88 and have been in last place since April 9. The loss moved the Mariners closer to elimination in the American League wild-card race. They began the night 7½ games behind the Oakland A's for the second spot with nine games to play. Seattle hasn't qualified for the postseason since 2001. Beltre's RBIs all came with two outs. He homered to the opposite field on a 0-1 pitch off right-hander Erasmo Ramirez (2-4), driving in Shin-Soo Choo and Elvis Andrus. His 476th career home run moved him into sole possession of 30th place all time, moving past Stan Musial and Willie Stargell. Seven of Beltre's 14 homers this season have come in September. The Rangers used an "opener" for the fifth time this season; right-hander Connor Sadzeck pitching a scoreless first inning. Right-hander Ariel Jurado (4-5) followed an "opener" for the fourth consecutive time, allowing two runs in five innings on the way to the win. Profar came all the way around to score on a fourth-inning bloop into shallow right field that eluded a diving Ben Gamel. Gamel's throw toward second base skipped all the way into the photographer's well next to Seattle's dugout, and Profar was awarded two bases. Banister, hired before the 2015 season, had a record of 325-313 and led Texas to AL West titles in 2015-16 before the franchise's first back-to-back losing seasons since 2005-08. The game was called after a rain delay of 1:09. . Beltre has 1,703 career RBIs, moving past Reggie Jackson and Jim Thome into 22nd place. . Mitch Haniger singled and has hit safely in 41 of 47 games. . Rangers "openers" have pitched eight scoreless innings in their five appearances. Mariners LHP James Paxton (influenza, pneumonia), who hasn't pitched since Sept. 7, threw a second bullpen session and hopes to return for two starts next week. Rangers CF Joey Gallo returned to the lineup after missing three games with a sore small toe on his right foot and hit his 38th homer, his third in four games.